I am trying to find out the names of the A.S.L.E.F. Branch Secretaries for the Eastbourne Branch and the dates they served between. if you have any info please can you let me know. This web page is dedicated to all A.S.L.E.F. 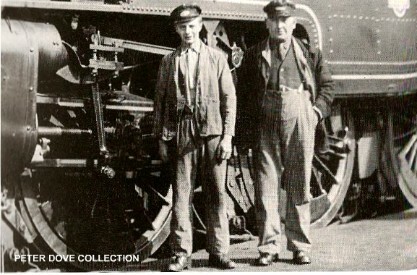 members who have worked at Eastbourne depot over the years, and it features A.S.L.E.F. 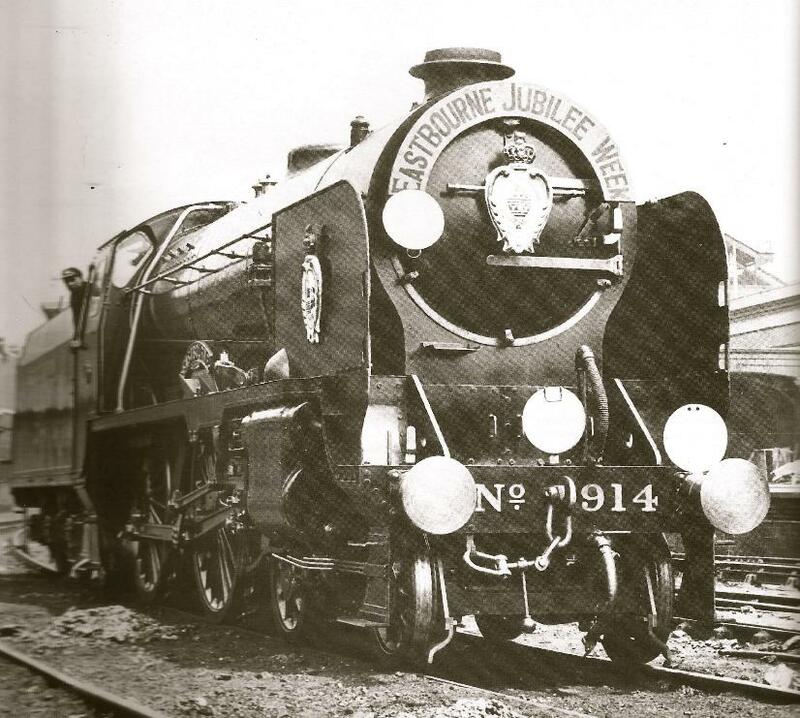 members who brought the trains of Eastbourne to life. 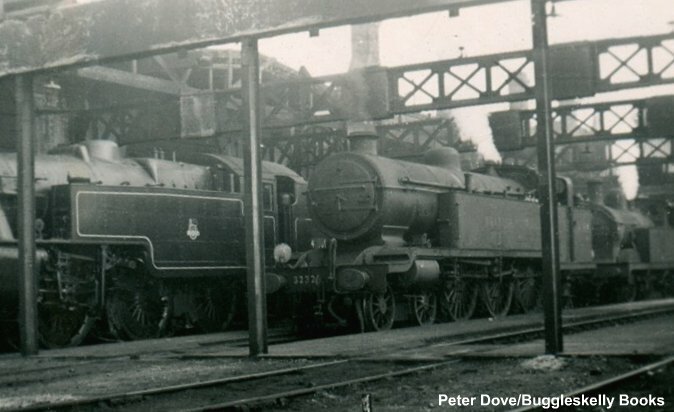 The LB&SCR opened a small engine shed in 1849 which was demolished in 1876. 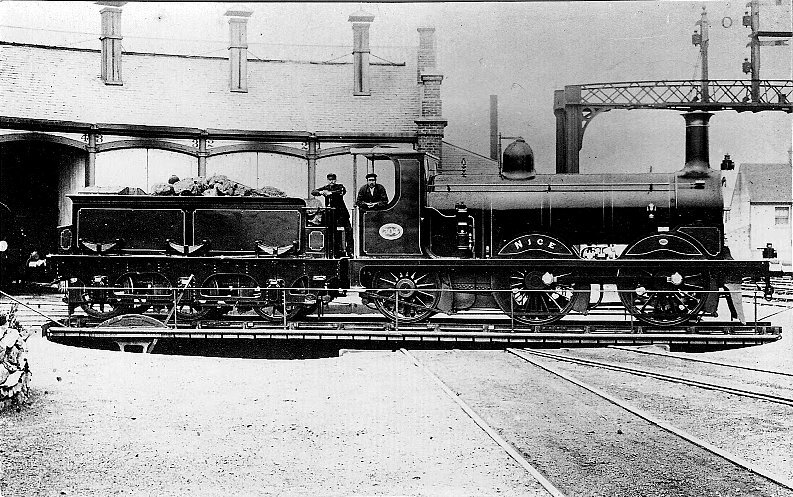 It was replaced by a semi-roundhouse in 1876, but this was demolished in 1912. A larger seven-road (seven track) shed was opened in 1911, but this was badly damaged by bombing in the Second World War and was never repaired. It closed in 1952, but the site continued to be used as a store for locomotives awaiting scrapping. 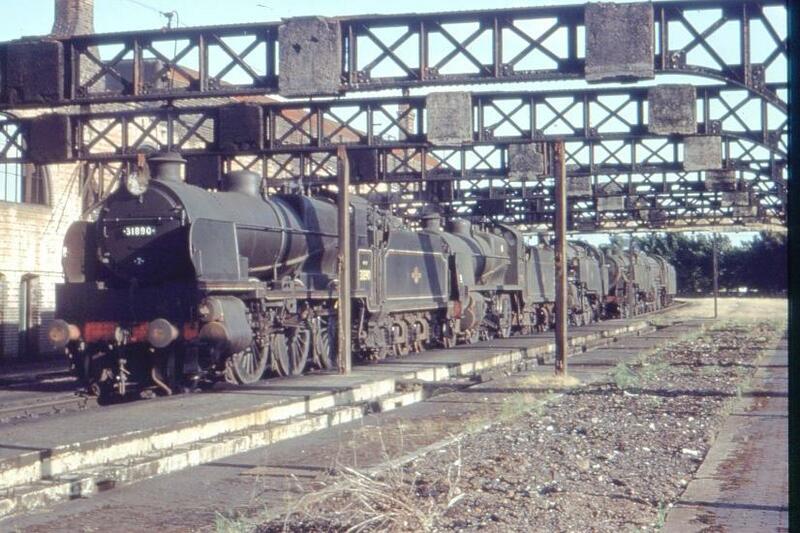 Until 1965 when diesel locomotives were stored here until 1968 the shed was then demolished in 1969. 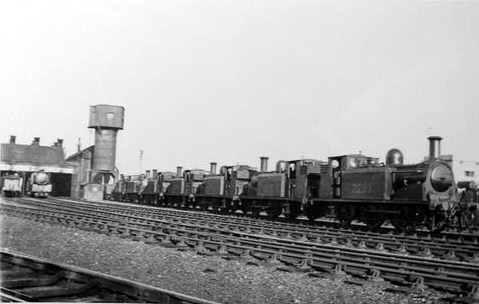 Today the first engine shed is now occupied by the current carriage sidings, whilst the latter is now wastland. 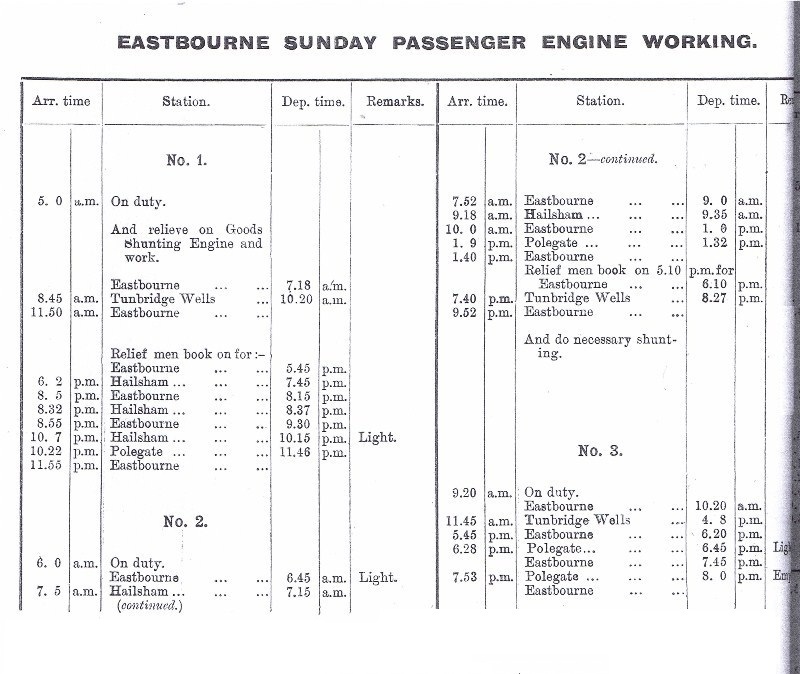 Eastbourne’s locomotive shed opened on 14th May 1849 by L.B.S.C.R. (Shed Code E). This was demolished in 1876 and it was replaced by a semi-roundhouse in 1876, but this was demolished in 1912. 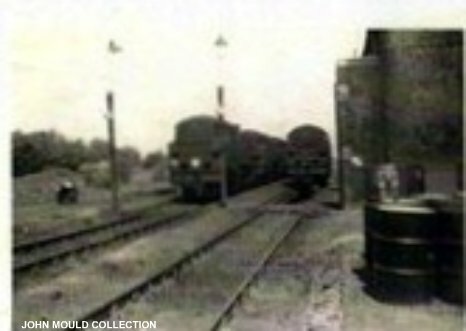 A larger seven road shed was opened in 1911. 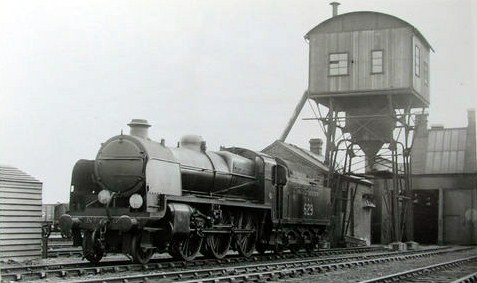 The locomotive steam shed remained until the steam was offically withdrawn on 13th June 1965. The steam depot remain opened but now called a Mixed Traction depot. 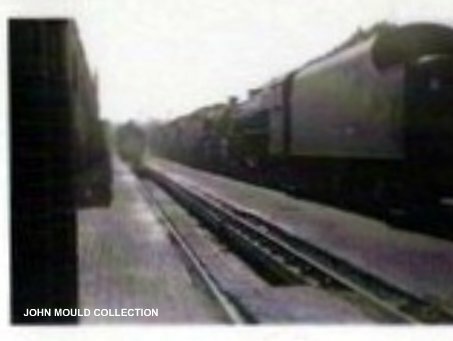 Mixed Traction finally closed in April 1969 along with Three Bridges M.T. & Feltham depots. 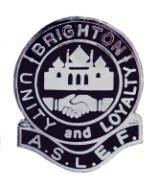 The Eastbourne Branch of A.S.L.E.F. was opened on 25th February 1906. 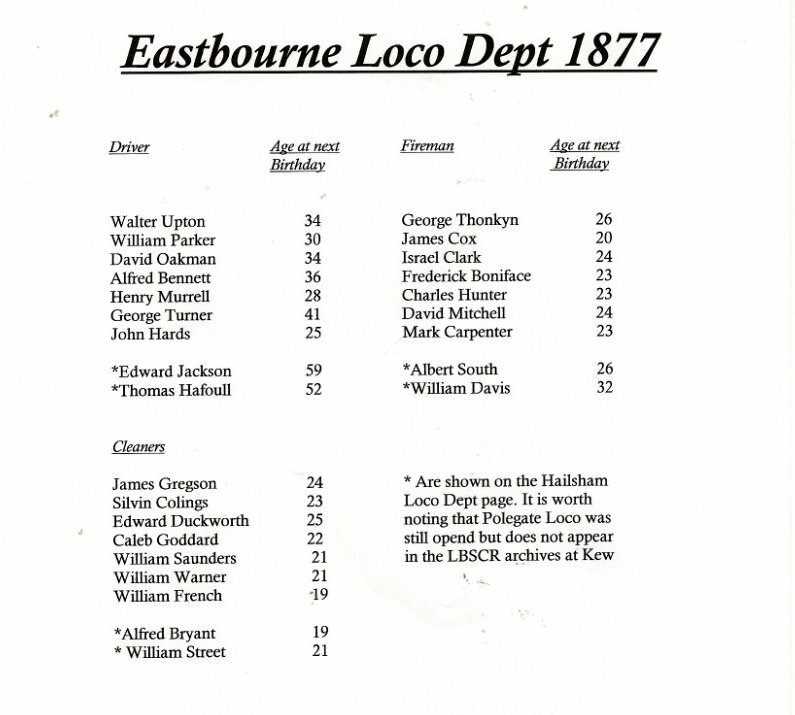 Above is a list of all the engine men that where employed at Eastbourne Locomotive Department in 1877. It is not know if this is list was compiled in seniority order or not. However, the list does clearly indicates the difference in the ages of both drivers & fireman at that period of time. 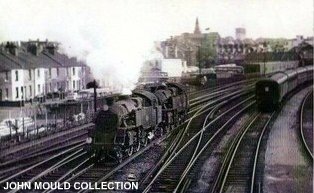 Royal Train conveying King Edward Vll arriving at Eastbourne on July 11 1903. 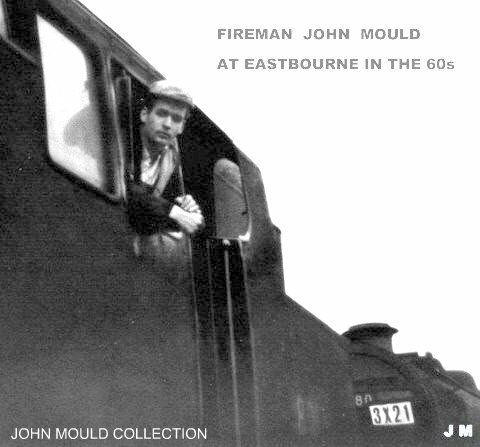 For some years James McKenly was the regular driver, of engine No.157 'Barcelona,' which worked regularly between Eastbourne and Tunbridge Wells West. During the winter months much slipping occurred over the steeply graded and steely curved section between Hailsham and Eridge, where an additional hazard was caused by leaves on the permanent way. 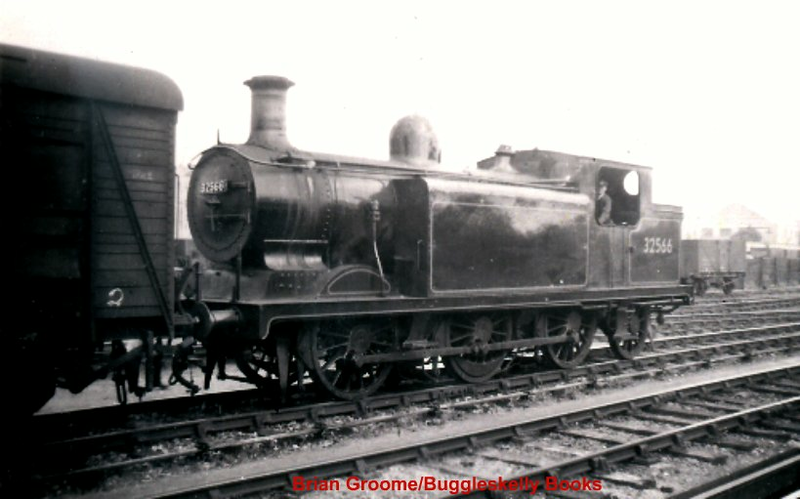 It was whilst he was in charge of this engine, that the coupling hook parted on Tooth’s Bank, about 2 ½ miles North of Heathfield, on the 11th December, 1889. Fortunely the guard was looking ahead at the time and was able to stop a minor incident becoming a disaster. 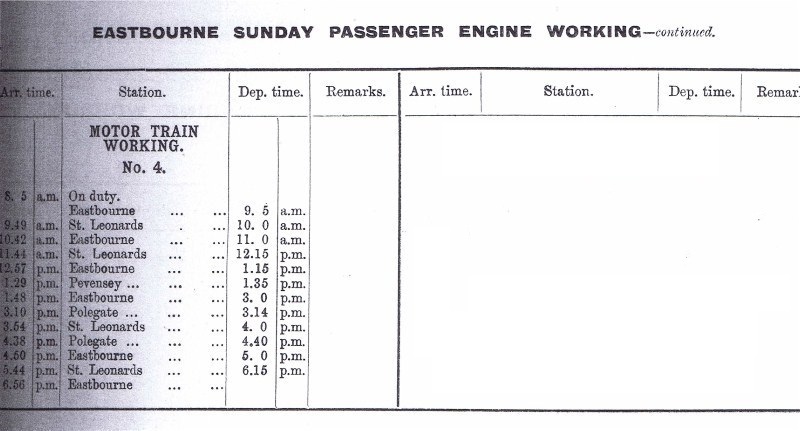 Temporary adjustments were made on the spot and the engine reached Tunbridge Wells without further trouble. 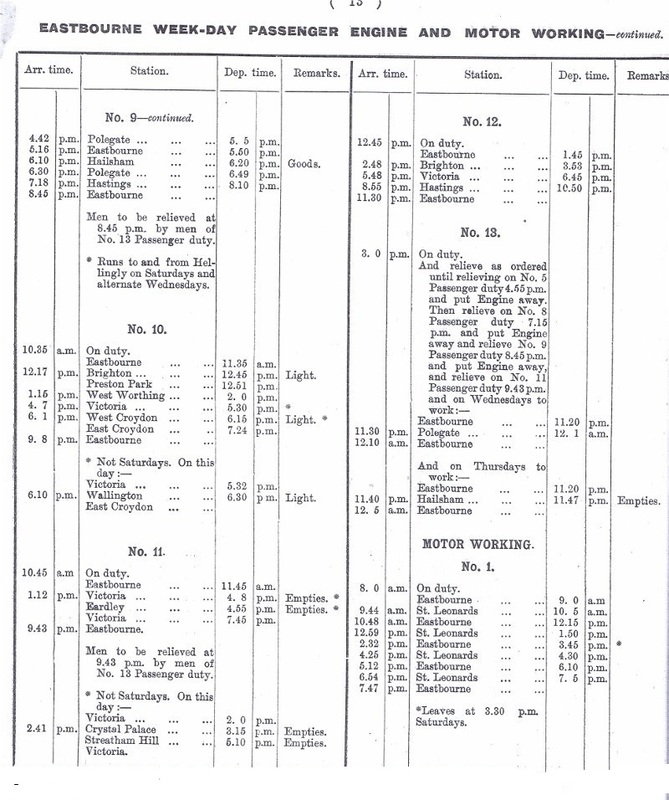 On the 1st September 1897, the 8.18 a.m. Eastbourne to Tunbridge Wells train worked by Driver James McKenly driving a 'D' Class tank No. 297 'Bonchurch' , down Tooth's Bank between Heathfield and Mayfield. 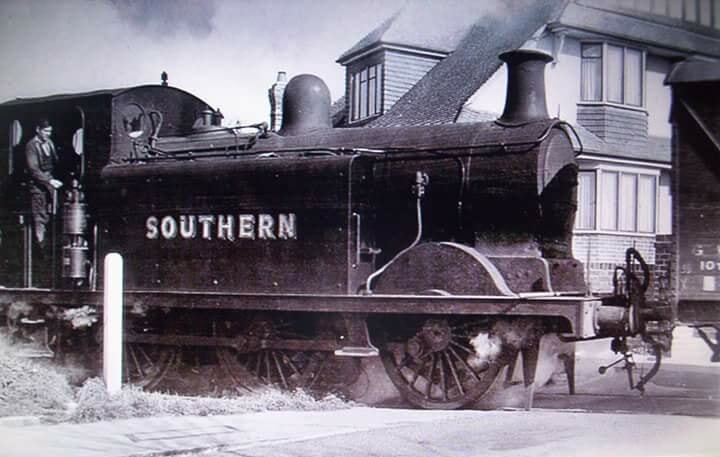 About 2 ½ miles North of Heathfield station at the foot of the bank the locomotive suddenly rolled violently and flung itself and the carriages off the tracks with a thunderous crash audible for a distance of 1 ½ miles. Some of the carriages came to rest at the foot of the steep embankment,while other strewn about the track and badly battered. Thirty passengers and the fireman were seriously injured while Driver James McKenly died before help arrived. Mr J Daw, a lay preacher, described his experience in a little book which was published in 1905. 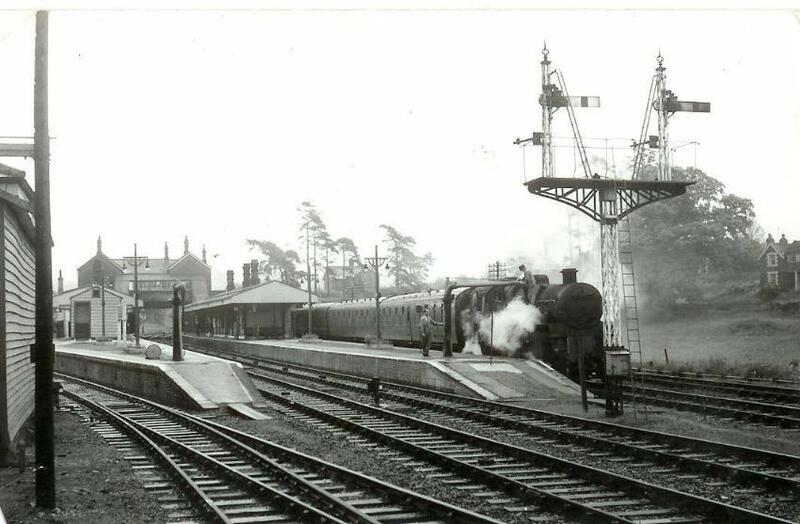 He joined the train at Hailsham, and as it neared Mayfield he felt a jolting. "In another moment the engine was off the rails and on the sleepers, the broken ends of which were knocking against the bottom," he said. 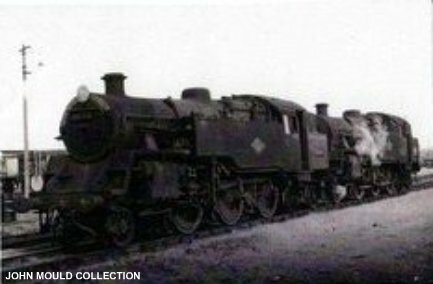 "Not knowing what was the matter, I turned to the window and saw the fourth carriage from the engine leaving the line on the opposite side to that on which the engine went over, and the fifth carriage following it and crushing into the end of it as they bounced down the embankment together. 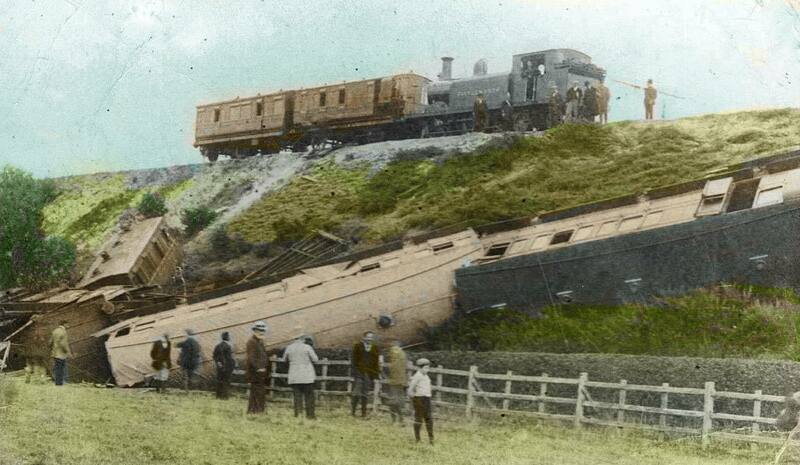 The middle part of the train was forced down the bank, the remainder of the carriages following after. "The appalling crash that came upon the carriage I was in is beyond my power to describe. When the noise was over I opened my eyes and looked up, and to my astonishment I was alive. "The roof, sides and doors of the carriage were gone. My head was cut in five places and blood was pouring down my face from a deep cut over my right eye, but I was perfectly conscious. "I stepped out of the ruins of the carriage and looked around. The engine was lying on its side on the eastern bank, puffing and panting like some monster in its dying struggles. Passengers were moving about, such as could walk. Others were being rescued from the broken carriages, some through the windows, some lifted out from the doors as the carriages lay on their sides, and some came through the bottom of the carriages that had been wrenched away from the framework. 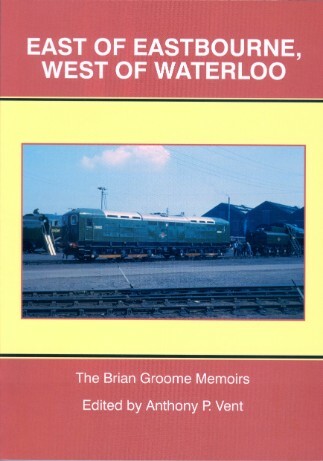 "As I glanced around the bank I saw the body of the engine driver. The men that had come to help the injured had found him under the wreck of the carriage I had been in." EASTBOURNE.—Socialist Hall, 95A, Cavendish Place. First Friday in the month. 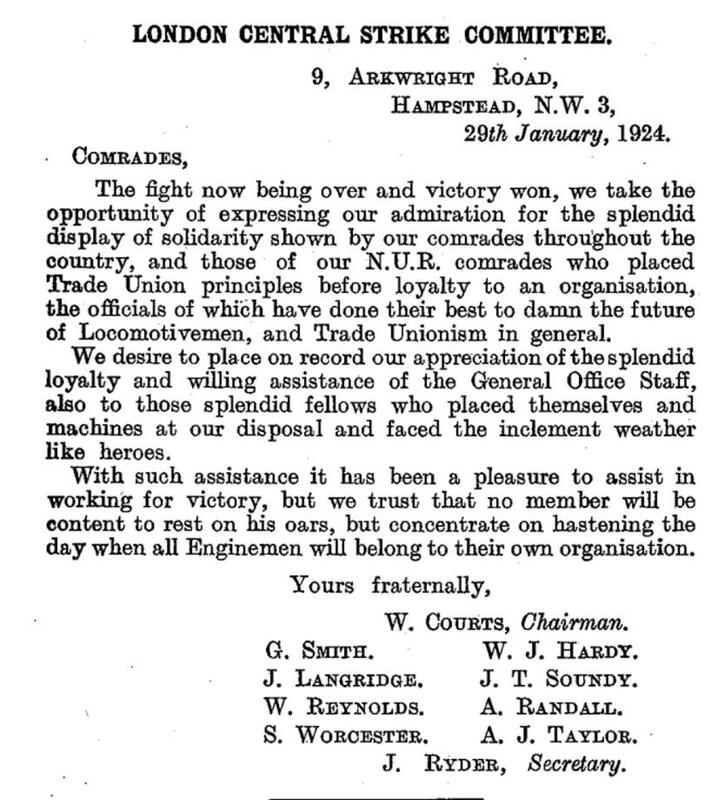 "That in the opinion of this meeting, the time has arrived for all enginemen, firemen and cleaners to become members of the Associated Society, and remain steadfast and true, and by noble brotherhood of societies, build up a gigantic federation, which would benefit all,"
and was carried unanimously. A vote of thanks to Mr. Warwick brought a very successful meeting to a close. Brother C. Broomfield, our branch chairman, presided, and we made one new member. That a few more may be forthcoming is the hope of BRANCH SECRETARY. We held our annual cricket match and super on Good Friday, the weather being all that could be desired. The cricket match, married v. single, was a great success and ended in a draw. a good crowd of spectators lined the field, so next year we shall have to think seriously of gate money. The super, to which 53 sat down, was held in our branch meeting room, with Brother Rogers in the chair and Brother F. Taylor in the vice chair. Several ladies were present, and after the company had done justice to the good things provided the tables were cleared and we settled down to hear a concert, arranged by Brother H. Marshall, of all "locomotive talent." 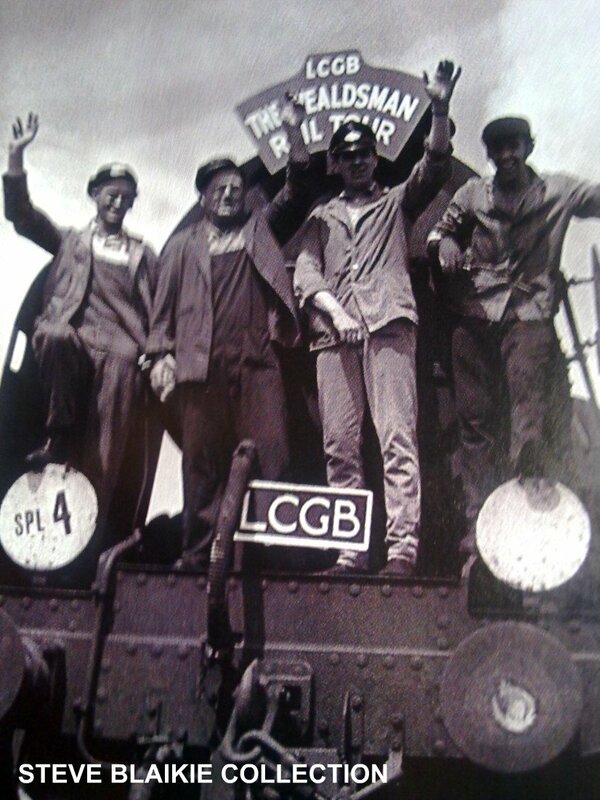 The branch secretary, on behalf of the committee, thanked all present for their support, and also our locomotive foreman for arranging the men's duty so as to enable them to attend the super. He also gave a brief report of last year's working, pointing out we had enrolled 2,320 members and effected a saving of £8,350 12s. 2d., a statement which was received with applause. A dance brought to a close s most enjoyable day. On Good Friday we held our usual cricket match, super,concert and dance. The cricket match was between the married men and the single, the former showing their superiority by winning. It was followed by a super wholly provided by the members and arranged by the members of a working committee, who had the assistance of their wives. The concert was a great success, Levett, Potter, Watson, Wilson, Sellwood, Jeffery, H. Marshall, G. Major, H. Rogers and A. Marshall contributing songs. Brother F. Taylor gave selections with his gramophone, and during the evening Brother H. Rogers, on behalf of the members, presented Brother G. Major with a walking stick, suitably engraved, on his enforced retirement, caused by the eyesight. Brother Major, in responding, thanked the members for the present. 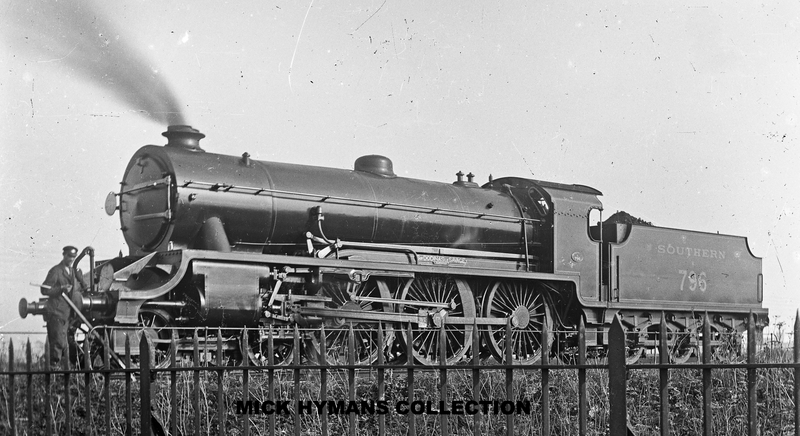 We had the pleasure of meeting Brother R. Niner and other members from the St. Leonards Branch, and a very enjoyable day was brought to close at 1.0 a.m.
A minor incident involved Driver O' Corner and his engine No.157 'Barcelona,' on the 11th May, 1912. 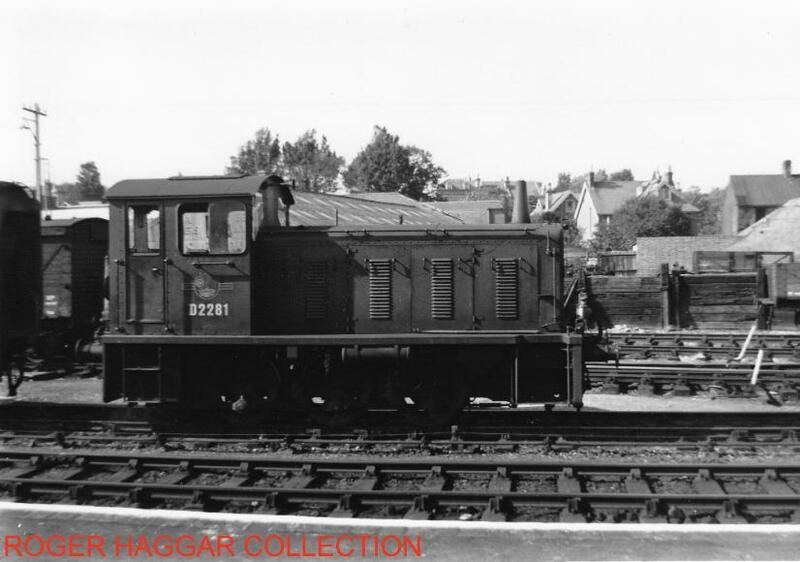 Whilst Driver O’ Connor was shunting coal wagons near Eastbourne shed and he mistook the signals, just as C2X No. 541 was entering the yard from the main line. The collision was violent and all men were injured, but the actual damage was surprisingly light to both engines. 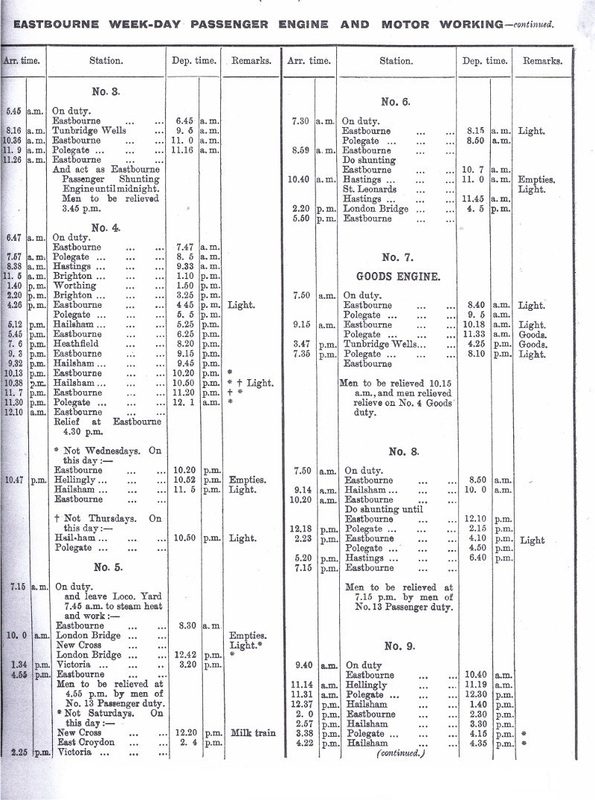 after working Station Masters and Inspectors special trains to Eastbourne from London Victoria and London Bridge. At the first meeting this year of the above branch, we had the pleasure of presenting a framed emblem to Brother C. Broomfield, who has held the chairmanship of our branch for the last three years. In responding, Brother Broomfield thanked the members very much, and among other things said he hoped they would give the new chairman the same support as had been given to him. Events in the south are very rare, but we note with pleasure the number of new branches that are opened up and down the country, and can't help but think that there is a bright future before the locomotive-men of this country. On Tuesday 15th April, I left Kentish Town for Eastbourne, to attend an inquest. 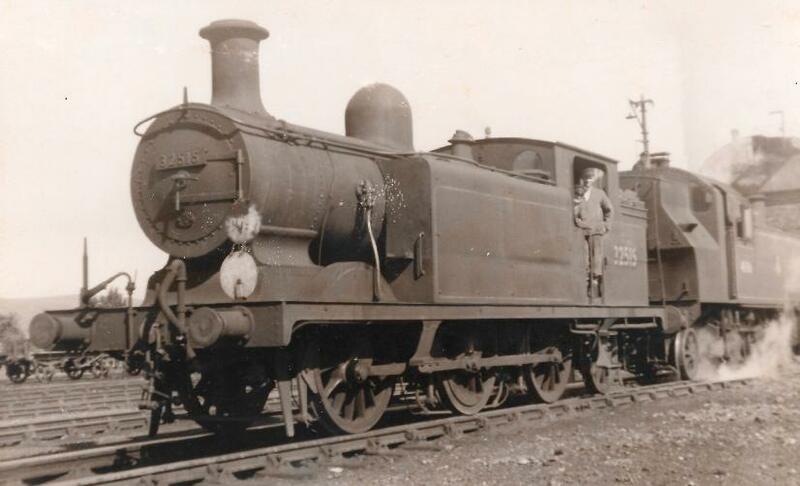 In this case an employee of the Corporation had been knocked down and fatally injured during shunting operations on a siding belonging to the above; the wagons were being propelled into the siding; our member was on the alert and had used his whistle. When this was made known in evidence, the issue turned on the question as to whether the shunter was in front. 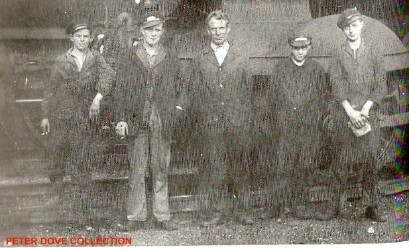 After a long controversy on this point between the representatives of the company and the Corporation, the jury, without retiring, "brought in a verdict of “accidental death " and exonerated the company's servants from blame, with a rider that the Corporation should notify their servants not to be on or about this siding when shunting operations were going on. SIR,—I wish to extend my sincere thanks to those members of Brighton, Horsham, Eastbourne, St. Leonards, Tunbridge Wells, Portsmouth and Newhaven Branches, who voted for me to represent them at the Annual General Meeting. By the courtesy of the Eastbourne Gazette we are able to give a photo of our comrade Councilor A. J. Marshall, until recently secretary of our Eastbourne Branch. Brother Marshall has joined the Royal Engineers, and quitted Eastbourne on 8th March for training, prior to service abroad. He will be well known to many of our members outside the London, Brighton and South Coast Railway, as he has been delegate to our Conference in the past, and was nominee for the post of organizer in the last election. Brother Marshall has not only been a valuable member of our Society and branch secretary for some years, but as a staunch Labour man has done much public service in his native town. He has for some years been a member of the Eastbourne Town Council, in the Labour interest, serving on the finance, general purposes, sanitary, education and housing committees, and held the following positions in addition: member of the Cavendish Ward War Relief Committee, deputy - chairman of War Unemployment Committee, manager of Willowfield Council School, president of Eastbourne Trades and Labour Council, chairman of Eastbourne Working Men's Club, member of the London, Brighton and South Coast Railway Locomotive Conciliation Board, London, Brighton and South Coast Railway Pension Fund Committee and secretary of our Eastbourne Branch. This is a splendid record for so young a man, and with it goes the respect and admiration of, not only his fellow trade unionist and socialists, but of his political opponents also. May he safely return to take up all the duties which he has performed so well in the past. On Saturday, February 17th, a Smoking Concert was held here, at the Rose and Crown Hotel, to give a send - off to our members, Brothers C. Broomfield, P. Fennell, G. Taylor, A. Waller, and some others, who have joined the R.O.D., and would be shortly leaving for abroad. Mr. F. E. Grimes, Loco. Superintendent, presided, and there was about 100 persons present. At the conclusion of the first part of the musical programme the Chairman spoke of the comrades who were leaving to take up an essential part in the great war, and mentioning them by name, proposed their health and wished them good luck and a safe and speedy return. The toast was drunk with musical honours. Brother C. Broomfield made a brief reply, and thanked those present for their expression of such kind feelings. 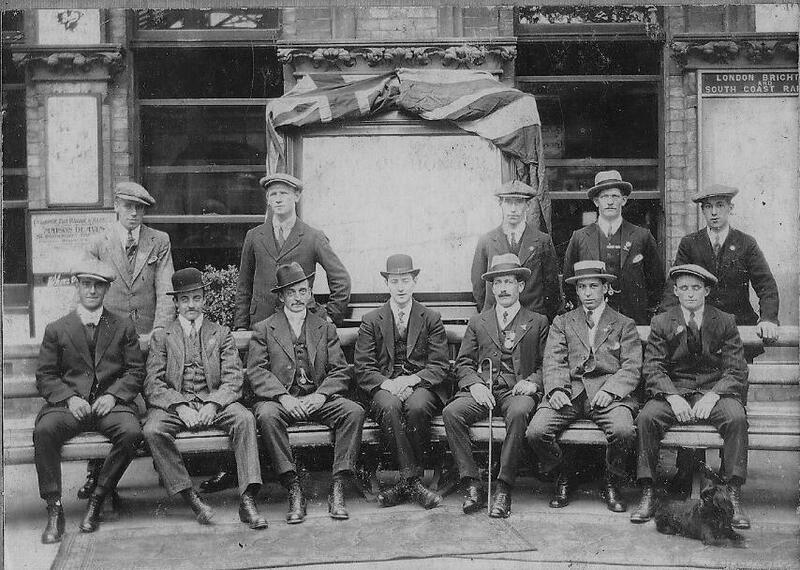 Messrs. H. Payne, T. Taylor, Gladman, Sellwood, Chatfield, Sergeant Gray, Corporal Hicks, and Private Thomas contributed to the programme, while Mr. G. Anslow rendered some verses suitable for the occasion. Miss Wildebank kindly acted as accompanist. 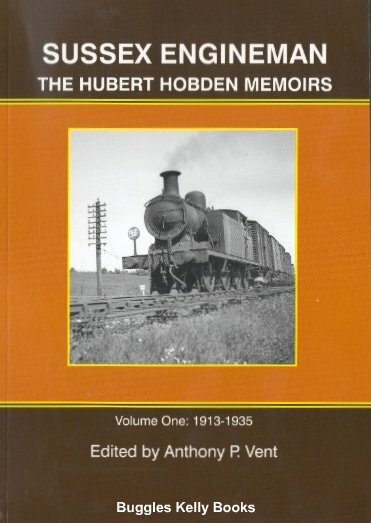 The Hubert Hobden Memoirs Volume One: 1913-1935 is published by Buggleskelly Books. For further information please send an e-mail to; buggleskellybooks@hotmail.com. 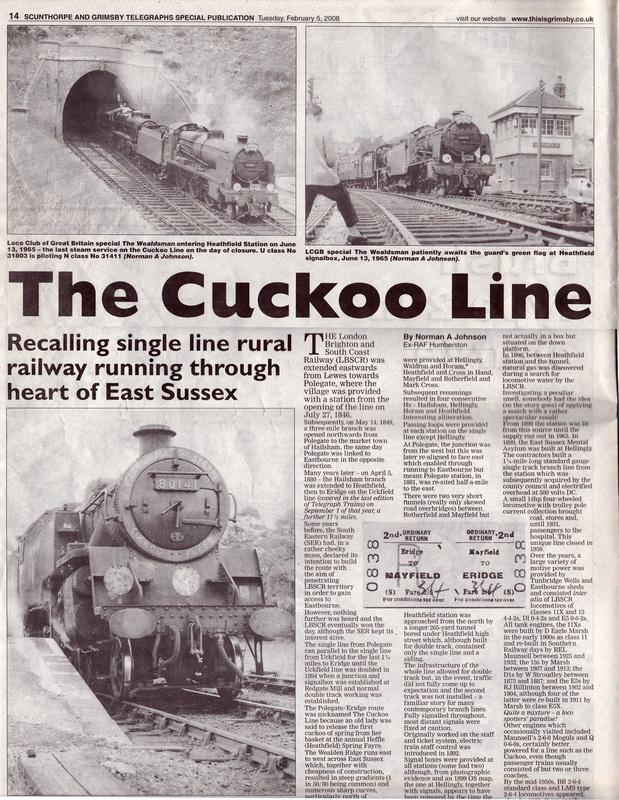 A full range of publications can be seen at the Facebook page; Buggleskelly Books Railway Publisher. 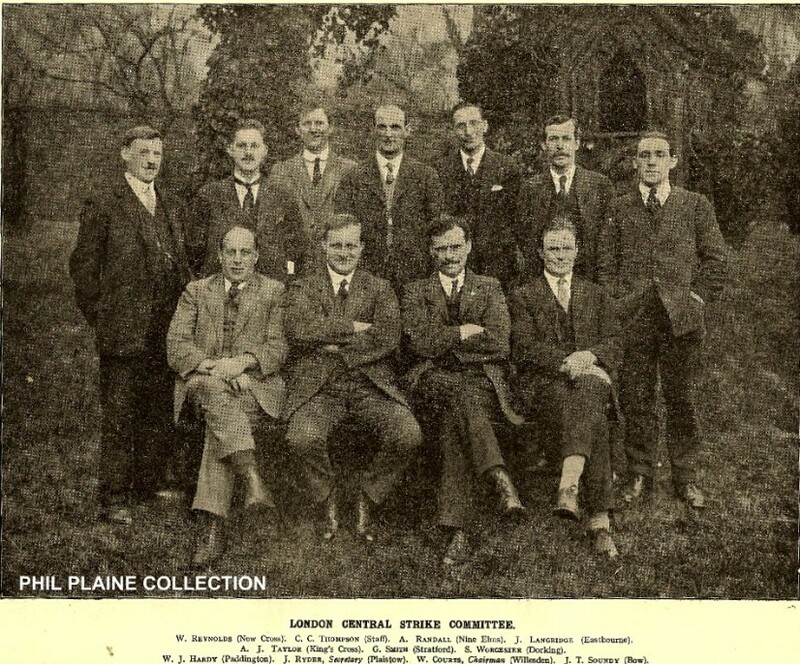 The 1924 London Central Strike Committee with committee member J. Langridge back row, fourth from the left. The Quarterly Meeting was held on March 10th, when Bro. Barton Wild attended. After branch business, the meeting was open to all Locomotivemen, and a good attendance had the pleasure of listening to an inspiring address by Bro. Wild, who took as his subject the “Aims and Objects of the Associated.” He took us through the early history of the society, showing how it had grown into a vast organization it is to-day; also how it had gradually improved the conditions of Locomotivemen, by National Agreements, Eight-hour day, etc. he appealed to all locomen to take an intelligent interest in the affairs of the Society, so that we can march forward in the near future 100 per cent. organized industrially and politically, and so ensure for locomotivemen more tolerable conditions of service and just remuneration for their labours. Questions were asked and satisfactorily answered. A vote of thanks to Bro. Wild for his very able address was carried unanimously. Officials and members are determined to do all possible to obtain that 100 per cent. in the near future. SIR,- Our members will no doubt be interested in result of the elections for the ensuing year. It has been our aim to arrange amicably for the N.U.R. and ourselves to nominate candidates, so to avoid an election, and it had again been decided this year that we should nominate two and the N.U.R. one. On the notice being posted that nomination papers could be obtained, to be returned by a date arranged by the officials and the scrutineers, there seems to have been a stampede of unofficial N.U.R. members and a “non” for nomination papers. As there was no law against it, they were duly filled up, and returned in order, and an election took place to elect three members to clear the sand out of the machinery for redressing grievances. The result was that two of ours and one unofficial N.U. R. man were elected. Now, had our members decided to have done the same as the unofficial N.U.R. members, the result would have been three of ours elected, as we have a good majority in our union; but, probably, they will have learnt their lesson when the next election comes, as I understand that had their unofficial members wished they could have been nominated, and avoided an election, and the usual antagonism, that results from such methods. When will they learn that discipline is necessary to progress? You will be more surprised to hear that one of them is the adopted Labour candidate at the forthcoming General Election. It will not surprise me if some of his colleagues don’t give him some of his own medicine when the Election comes, although I hope they will remember that it is the principle, and not so much the man, they vote for. I think if he is asked, when he commences his Election campaign, to explain his action in regard to it, he will have some difficulty in giving a satisfactory reply, and he may probably learn that it necessary to have discipline even in a Trade Union Election, and that majority rule should be respected. Where were the “grousers” during the branch meeting? Well, you missed a treat: Sectional Council minutes pulled to pieces and put together again, three out of the four points concede by the Company, more money in your pockets; so come and help yourself to more. What a debate on the vital question of transfers by those who have been and those who will be! Electrification affects you all, so come and have a say in the matter. New men attended this first possible meeting: old hand, you want to look into that before the next meeting. The new officers are all triers and willing to teach or be taught. To the older members I say: Come and show them you approve of the new generation; and to the youngsters: Come and pile in, show how much you have learnt; But to all: Help yourselves, `ware sparks. They are on their way to Eastbourne, so let us 100 per cent membership, and a branch room well crowed. There is nothing to be afraid of. We want all your grievances at the branch room to be dealt with satisfactory. To those who are outside the Society: I appeal to them join us and look to the future. Yes! We are here again after a very interesting 2 hours discussing several important items, especially the companies’ proposals for the new negotiating machinery, which were not acceptable to the members present at our February meeting, where upon they decided to forward to the E.C. a resolution endorsing their action in refusing the Companies’ proposals, and also ask for the restoration for the 2.1/2 per cent cut, especially now the Companies are having a “good time” according to their finical position. Traffic receipts up, and still going up, so I appeal to all branches to forward your resolution to your E.C. to press for return to normal times. Now to the non-unionists at the depot I am Glad to report we have made 10 new members since January. Why not make it 20 by our next meeting on April 8th? I ask: Where will the “nons” be in case of accident, and nobody is exempt from them? Think of your wife and family; it only cost 1d. a day to belong to our Society. Think of it, the price of a daily paper. I appeal to those outside: Get your membership form. I have plenty that want filling up. Do not like some our recently transferred “nons” from this depot; be approached by the secretary asking for your card and find that you have not got one to produce. Come in with us; we shan’t bite you! Now I appeal to all members: Do not use the mess room as a branch to air your grievances. They will not get rectified there! Take them to the branch room for just 2 hours a month of your time, and sometimes exciting a that. A smoking concert was given in honour of our recently-returned member, Bro. G. Hall, one of our stalwart trade unionist of 40 years standing. We were pleased to welcome Organising Secretary Bro. J.V. Sweeney, who made the presentations to Bro G. Hall of a suitably subscribed barometer and a hand-bag to Mrs Hall, with short address regarding our Brother’s long membership and the splendid work of the Society during his long service to the railway company from cleaner to driver, and with a hearty good wish that Bro. G. Hall will have a long years of health in his well-earned rest. 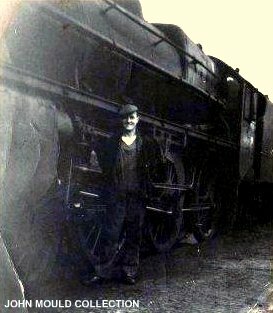 Our Loco foreman, Mr R. Steele, also attended and enjoyed our company for the evening, which seemed all too short, and gave us a short record of Bro. G. Hall service from 1889 to 1934. he had been looking for late bookings on duty, but I gather he was unfortunate, and his closing remarks were: “We must have had an angel working amongst us.” We continued our very pleasant evening of song and laughter with a room full of our members and N.U.R. members and their wives, to who a cordial invitation had been extended with a presentation from the traffic dept. at Eastbourne of a set of pipes, pouch and tobacco, with appreciation of a long service at Eastbourne. Our chairman, Bro. J. Langridge , of whom we all have to thank for his hard work in arranging the evening’s programme “made good use of his hammer,” it seemed to get our artistes from nowhere we seemed to be crowed out with talent. I should like to thank all those responded to our chairman’s hammer during that most enjoyable evening at which we were granted an extension of licence till 11-30 p.m., and closed memorable evening with "Auld Langs Syne"
We are still making good headway here, four more new members admitted at our last meeting on June 10th, making a grand total of 20 since January of this year. Our meeting was attended as usual, by the same number of “regulars” who very seldom miss a meeting, and the same number who get first-hand information from our H.O. regarding all working being done by our fraternity. I would appeal to all those very seldom attend to give a few minutes in the branch-room and listen to a few of the facts, and not rumours which are floated occasionally at the depot. Well we still have good business for our L.D.C. to attend to. I think with the help of our stalwarts a lot can be rectified. I wish to remind our members at Eastbourne: “Creeping paralysis” (electrification) is overcoming this district, and will affect all of us in some way or the other: get to your branch meeting and hear or suggest what should or can be done for our benefit. Our short meeting was brought to a close at 3-15 p.m. and re-opened again as an open meeting for all locomotivemen, at which we had with us our Organising Secretary Bro. J.V. Sweeney, who gave us a very good explanation of the Society’s demand for the return of our cuts and conditions and the retention of the Wages Board, explaining some facts and figures which I hope, has enlightened a few of our members. I would have been pleased to have the “nons” listen to his speech, but they are satisfied with any conditions, and do not need help in the return of their cuts. If they did they would not be outside. I suggest if the companies want to save money they take it from those that do not assist in keeping what we have already got. The meeting closed with a hearty vote of thanks. We have just had one of the most important meetings with the largest attendance for a considerable time. It being an open meeting we had the priviledge of welcoming visitors from Brighton, Hastings, and St. Leonard's, with N.U.R. 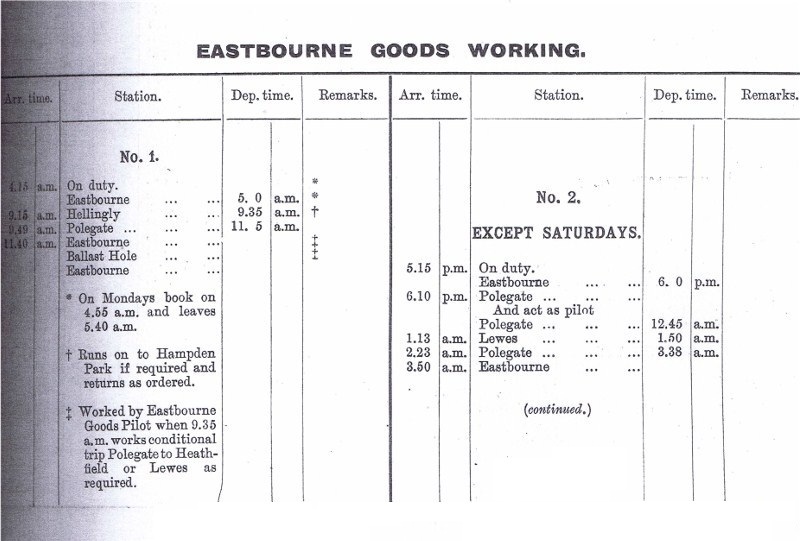 locomotive men from Eastbourne, who are in some way, and there are not many who are effected by electrification in this area, which, according to an approximate list posted at the depots affected, will displace about 60 sets of men on steam work. We had with us Bro. F. Jeans, S.C. Secretary, who kindly gave up his week-end to explain the Council's agreements regarding transfers and other vital information on points effecting our memberswho will largely suffer. i must say it was a very busy afternoon for Bro. F. Jeans. He was ably assisted by Bro. J. Gayler, from Brighton, who was in the fight on the last extention to Brighton, and he described how they were dealt with by the company and how the were affected. now, Eastbourne, Hastings, St. Leonard's. and Brighton, be careful what you are up to. I have suffered, and I speak from personal experience, owing to electrification in the Croydon area, so I advise all members to look in their branch room at every meeting held from now till the crash comes, and have a voice in your future, and it is yours, I can assure you. I sincerly hope Bro. F. Jeans helped those who were in doubt, and I am positive he did his best to explain some important items under our National and Sectional Council agreements, which no doubt will wound as well as heal. The meeting ended with a vote of thanks from our members from St. Leonard's branch, and concluded a busy afternoon, and I am sure well spent. 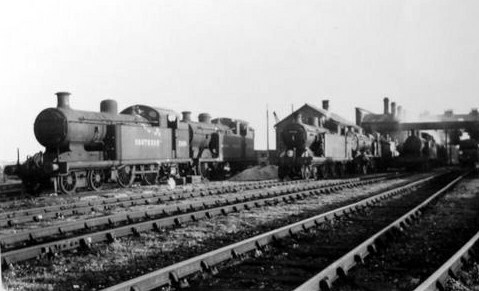 AS A RESULT OF ELECTRIFICATION ARRIVING AT EASTBOURNE, A NUMBER OF THE JUNIOR EASTBOURNE ENGINE-MEN FOUND THEMSELVES HAVING TO MOVING ACROSS THE COMPANY, WITH SOME RE-LOCATING AT THE NEWLY OPENED NORWOOD LOCO SHED. 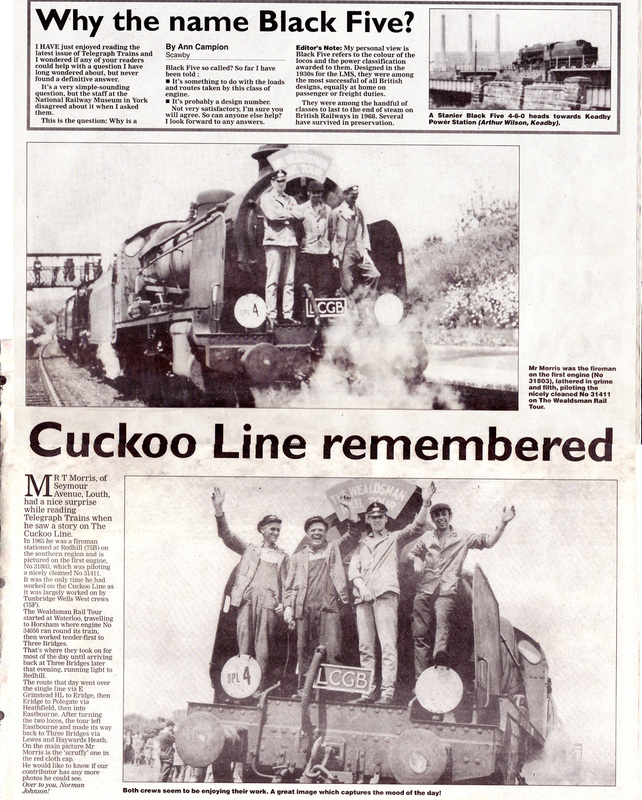 A report from the Locomotive Journal has not appeared for some time. Attendance at branch meetings has not been what it should have beeen in view o the recent happenings on the railways. Perhas when the R.S.N.T. awards and all they imply are fully understood members will realise that their obligations to the Society (and themselves) does not finish when they have paid their contributions. The attitude of self-satisfaction must give way to the spirit of 1924. The branch committee arranged a smoking concert for October 23. A fair number, including several members from Ore and St. Leonard's branches, and several N.U.R. members, and a representative from the Eastbourne Trades council and local Labour Party, braved the elements to give a send-off to one of our active members, Bro. 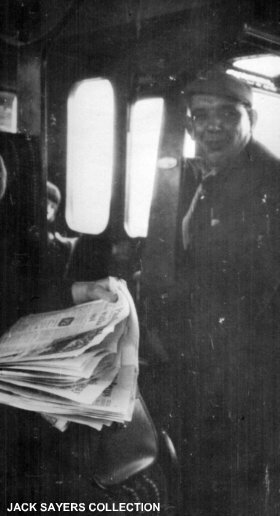 C. Lawerence, who has retired from the railway company. Bro. 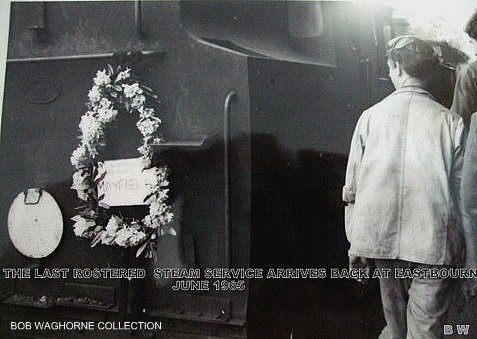 Steele, Locomotive Foreman, wrote and apologised for his being unable to attend. During the evening musical items were rendered by Bro. A. Beeney (and "Ginger") of St. Leonard's branch and other local stars, with Bill Painter of Brighton, at the piano. During the evening, Bro. J.O. Sweeney, Organising Secretary, presented Bro. Lawrence with a Westminster chiming clock as an appreciation for the services he has to his fellow-workmates. Bro. Sweeney, in his remarks, referred to the record of Bro. Lawrence's services to the Society and the working-class movement in general, and the need for such spirit to be carried on by the present generation in order to safeguard the future. Bro. 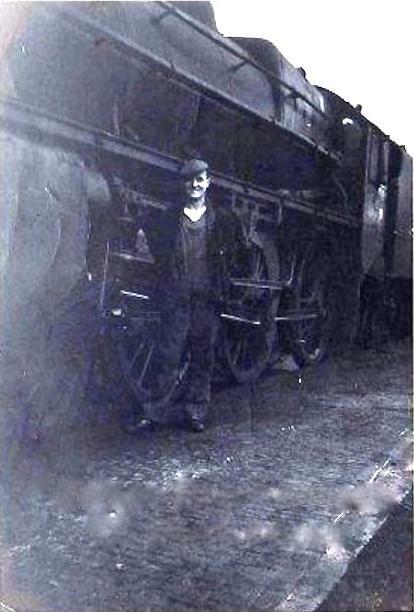 Lawrence suitably replied, and stated that although he had finished as far as the railway were concerned his interest in the movement was still as great. At the time of writing he is contesting a seat on the Local Town Council in the interests of the Labour Party. The branch membership is still on the upward trend; there are only three "nons" at the depot and it is pleasing to see some of the younger element at the branch meetings. May I, in closing make a further appeal to those members who have not done so to join the "Trade Union Club" and assist the management committee to make the club where Trade Union activity can be carried on in comfort. 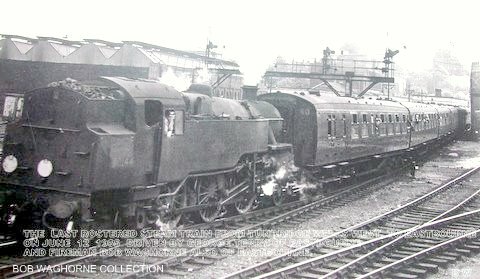 A during the early 1950's there was a 6.40 p.m. Eastbourne - Polegate goods train, this train was usually a heavy formation and nearly always double headed. 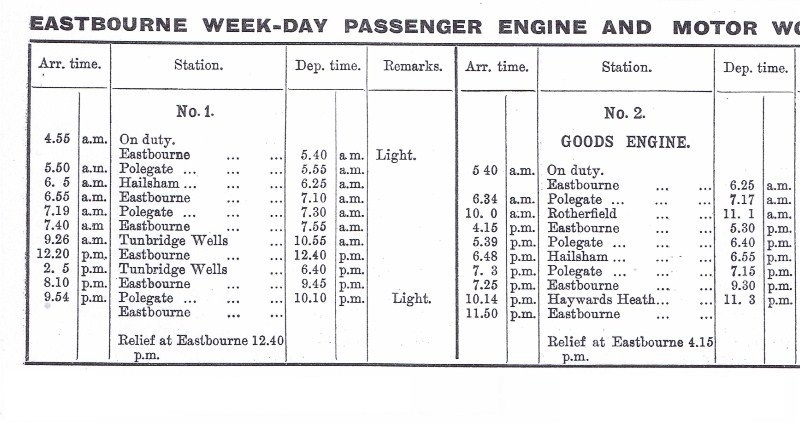 On the evening of 2nd February, 1951, the goods train stormed out of Eastbourne yard in fine style with engines Nos. 32543 and 42074 (L.M.R. 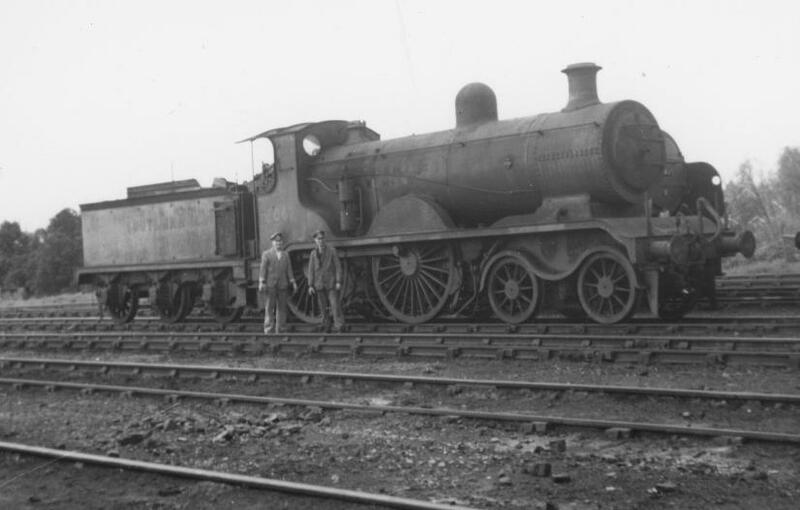 2-6-4T), but the road was set for the engine line instead of the up main. In the darkness this went unnoticed by the crews who also failed to notice to observe that the up advance starter, which was off was further east than it should have been, so the train continued to gain speed. 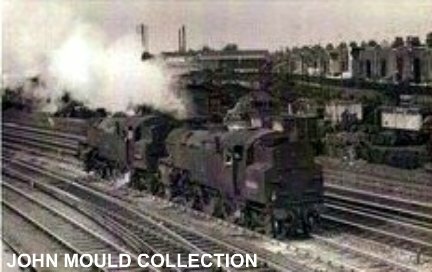 It was only when the cavalcade was thundering into the shed yard and the electrical substation appeared to the right instead of the left that the crews realised all was far from well, and shut off steam, but too late to prevent a violent collision with N class 2-6-0 Nos.S1825 and L.M.R. tank 42065. 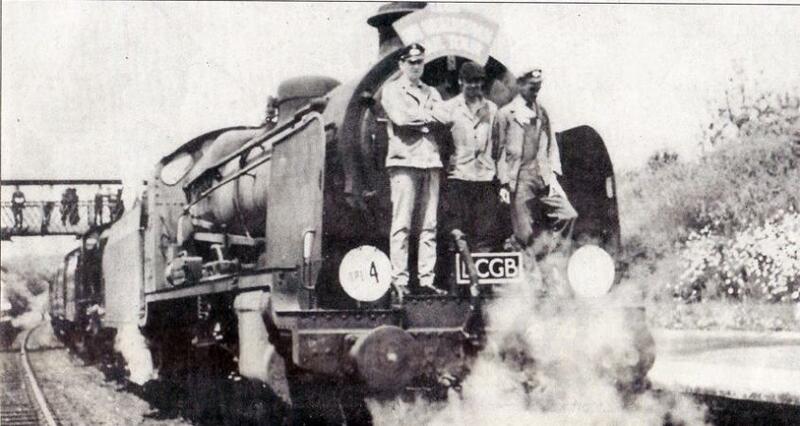 Several of the enginemen were injured and all for locomotives considerably damaged. The guard was also badly shaken, but was able to leave his van and hurry back along the track to protect his train in time to stop engine No. 32538 from crashing into the wreckage. Another Re-union and Social Evening on April 27 brought members old and new together again. Bro. W.G. 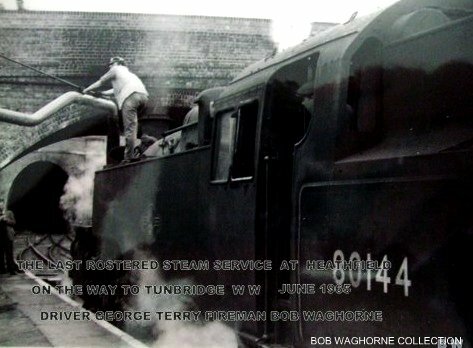 Osbourne, Motorman at Eastbourne, attached to Ore branch, who retired recently was presented with a wrist watch; his wife received an umbrella. Mr. Rodgers, D.M.P.S., in making the presentation, gave a review of the changesin the railway worldduring George’s years of service. 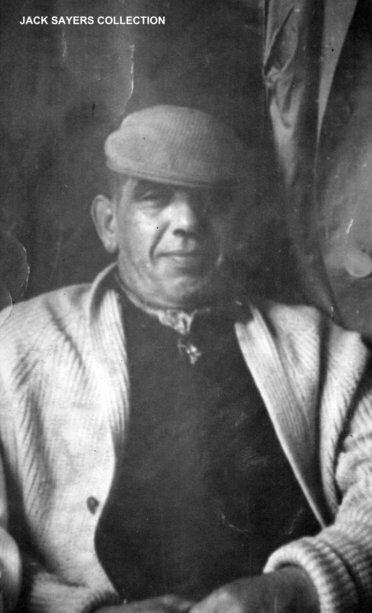 George, who had been a member 40 years, suitably replied; he joined in 1908,had taken part in all our troubles with authority for improved conditions, having divided his time between Orpington and Eastbourne. Best of luck, George. May time deal with you both lightly. Our thanks to those who provided the catering and entertainment. May the good work continue. Branch attendance is fair; the new Manning Agreement for Electric Trains has given promotion a great fillip here. Our Social Evenings bring old and young together again and we enjoy it; with twenty pensioners attending there is always a good discussion on the “good old days” but we begin to think the future has a lot in store, too. B. Jenner, a pensioned member, has passed on. Here was a likeable old character who left his mark during his dy. Also we have lost the service of J. Barely, a worthy member and L.D.C. representative; the suddenness of his passing took us by surprise. Members of Exeter branch may remember him. Branch meeting remain at the same level of attendance and, being affected by the Dual Link alteration in the P.T.R.A., much discussion arises, the Pool being a point we think we should watch closely. Some of the facilities are not up to standard but it seems we “flog a dead horse” where Messrooms are concerned. Saturday, June 10, gave us another of our social evenings with presentations to Drivers C. Fears and A. Divall, both having served the Branch well in official capacities as Secretary and Chairman repectively, and service to the Organisation is always respected. Many turned up, both old and young, and, in addition to their parting gift, copies of The Lighted Flame were presented to both. Past and present Shed Masters were amongst us. Thanks to the Committee – may their good work continue! Another Re-union and Social Evening on April 27 brought members old and new together again. Bro. 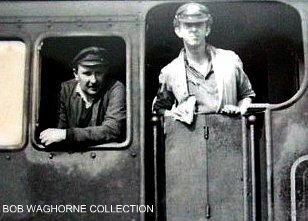 W. G. Osbourne, Motorman at Eastbourne, attached to Ore branch, who retired recently was presented with a wrist watch; his wife received an umbrella. 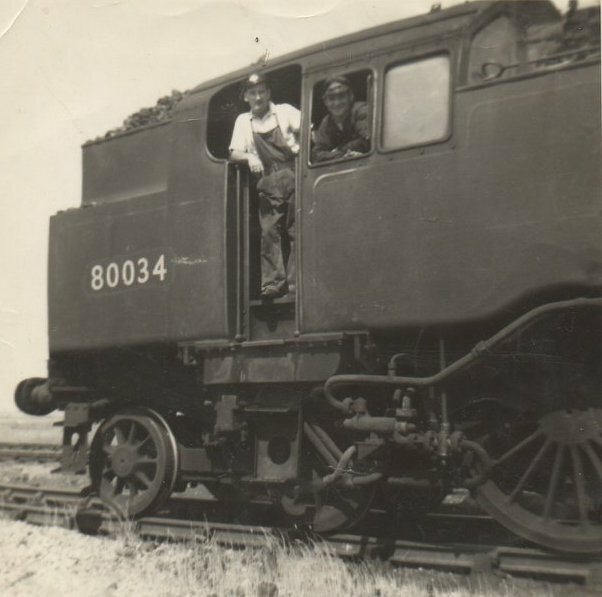 Mr. Rodgers, D.M.P.S., in making the presentation, gave a review of the changes in the railway world during George’s years of service. George, who had been a member 40 years, suitably replied; he joined in 1908, had taken part in all our troubles with authority for improved conditions, having divided his time between Orpington and Eastbourne. Best of luck, George. May time deal with you both lightly. Our thanks to those who provided the catering and entertainment. May the good work continue. 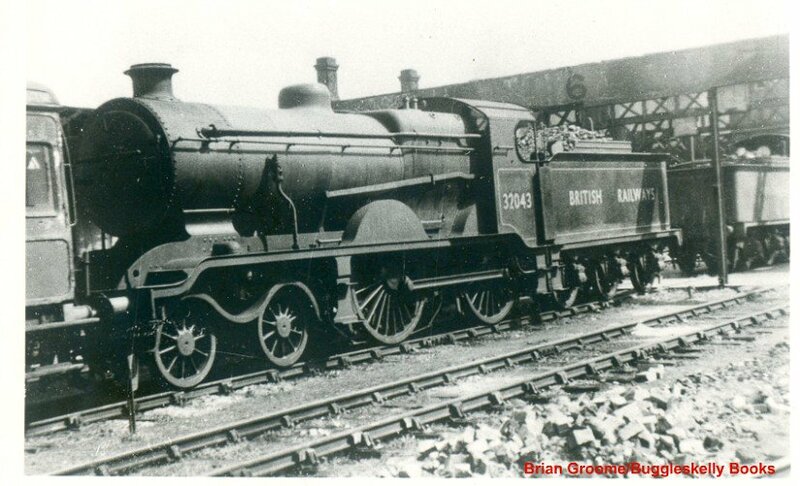 Ex-LB&SCR tanking engines photographed whilst shunting in Eastbourne yard. Driver Roy Tutt & Fireman Bob Waghorne in C1963. 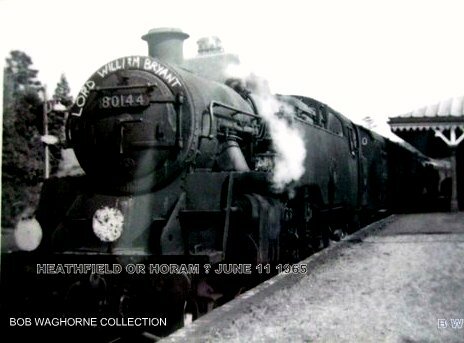 The last rostered steam train from Eastbourne to Tunbridge Wells West via Heathfield "the Cuckoo Line" on 12.06.1965. worked by Eastbourne crew Driver George Terry & Fireman Bob Waghorne. 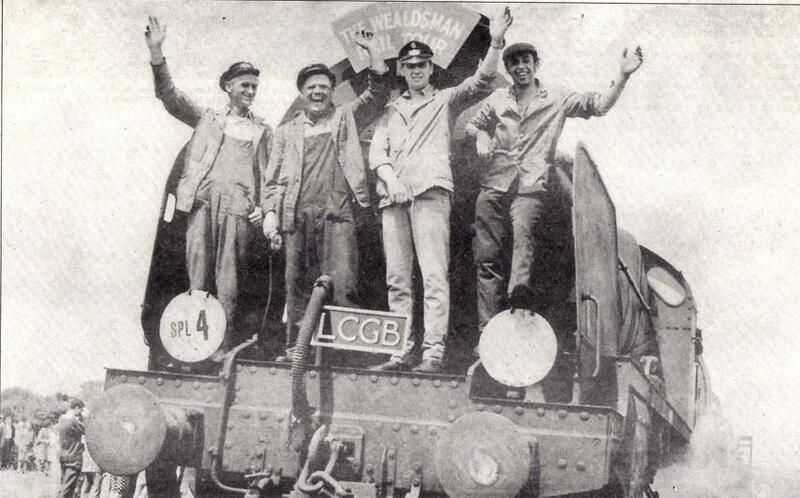 Above Left at Horam (may be Heathfield?) and Right Bob Waghorne taking water at Heathfield. (Bob is pictured looking out of cab window). Above Right: arrived at Eastbourne for the last time. 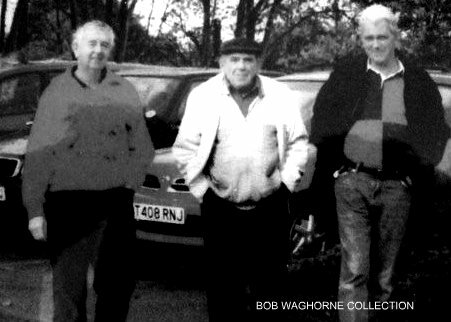 Bob Waghorne is pictured. Eastbourne shed was badly damaged by bombing during the Second World War and was never repaired. 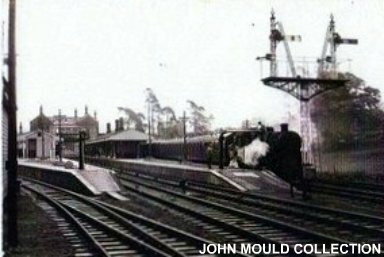 It closed in 1952, but the site continued to be used as a store for locomotives awaiting scrapping. 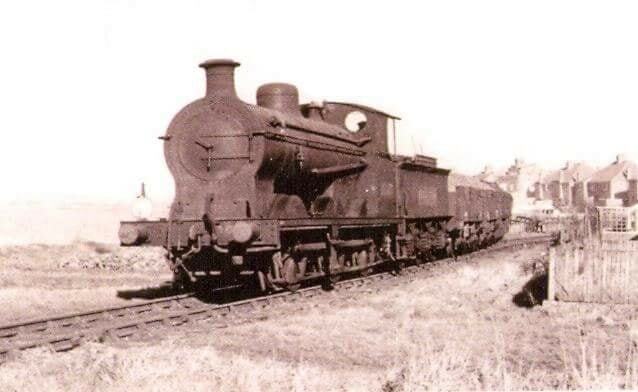 Until 1965 when diesel locomotives were stored here until 1968 the shed was then demolished in 1969. 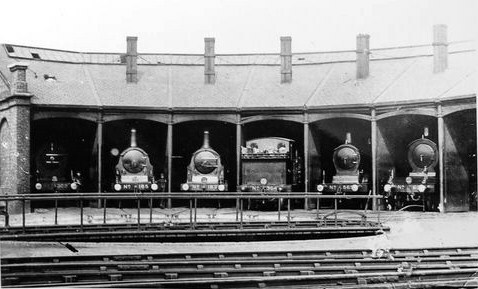 Today the first engine shed is now occupied by the current carriage sidings, whilst the latter is now wasteland. 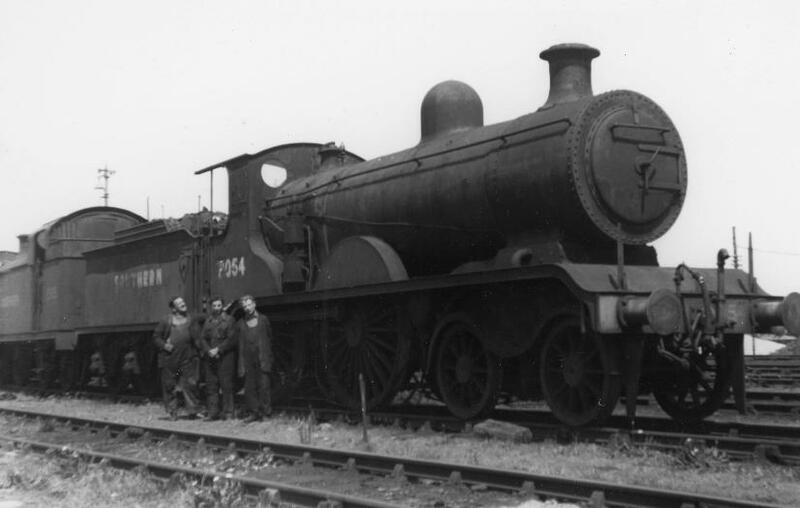 Outside of Eastbourne shed c. 1949. 4-4-0 No. 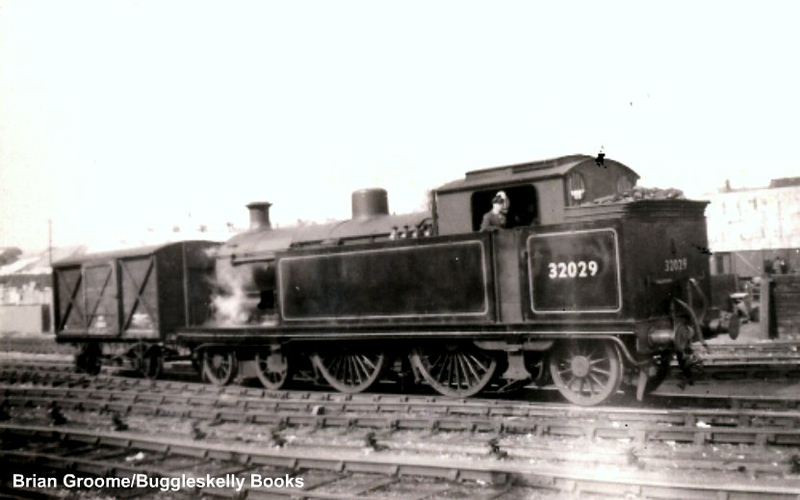 32043. 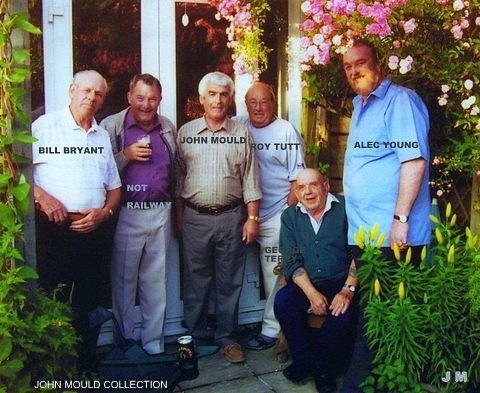 Left ~ Right: Bill Bryant, Peter Martin, John Mould, Roy Tutt, George Terry & Alec Young. REDUNDANT STAFF AT CLOSING ALLOCATED TO VACANCIES SHOWN ON THIS RESULT SHEET ARE REMINDED THAT THEY SHOULD APPLY WITHIN FOURTEEN DAYS OF THE POSTING OF THIS LIST IF THEY WISH TO NOMINATE A SUBSTITUTE DEPOT FOR THEIR CLOSING DEPOT IN ACCORDANCE WITH CLAUSE 21, AND GOVERNED BY THE PRINCIPLES OF CLAUSE 16 OF THE P.T. 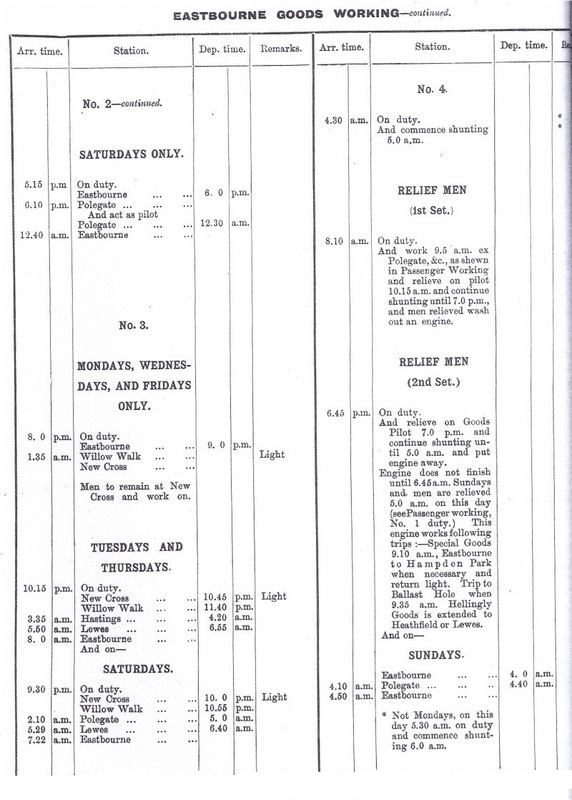 & R. ARRANGEMENTS FOR FOOTPLATE STAFF. PRO-FORM FOR THIS PURPOSE WILL BE ISSUED TO EACH MAN CONCERNED. 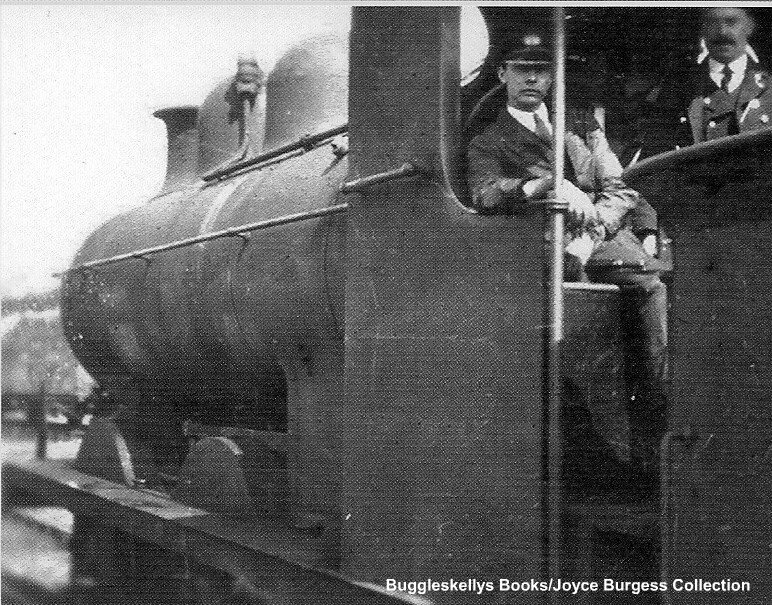 page; Buggleskelly Books Railway Publisher.